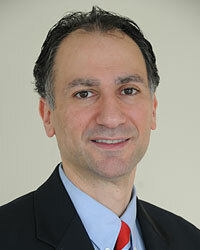 Dr. Hamlet Garabedian is a board certified Oral and Maxillofacial Surgeon. He attended dental school at the Harvard School of Dental Medicine in Boston, Massachusetts from where he graduated with the highest academic honors. He then went on to attend medical school at UCLA School of Medicine in Los Angeles, California. He completed his internship in general surgery and his residency in Oral and Maxillofacial Surgery at what is now the Ronald Reagan UCLA Medical Center where he also served as chief resident. After completing his training, Dr. Garabedian moved to New Jersey where he practiced the full scope of Oral and Maxillofacial Surgery for seven years with an emphasis on complex implant reconstructive surgery, bone grafting, facial trauma, wisdom teeth extraction and office anesthesia. Dr. Garabedian and his family then moved back to Southern California where he joined his longtime friend and colleague to establish their new state-of-the-art practice in Glendale, California. Dr. Garabedian is on staff at Glendale Adventist Medical Center and St. Joseph Providence Hospital in Burbank California. When not working, He likes to spend time with his wife and two children and enjoys biking, swimming and playing tennis. Dr. Garabedian is a Diplomat of the American Board of Oral and Maxillofacial Surgery and a Fellow of the American Association of Oral and Maxillofacial Surgeons (AAOMS).